Sleep problems are a common among those with Parkinson’s Disease (PD). If you have Parkinson's and experience poor sleep, it's important to talk to your doctor, as treating your sleep-related symptoms may improve your overall well-being. The first step in dealing with your sleep problem is determining the root cause. If you have early or mid-stage PD, chances are your sleep problems involve at least one of the following: insomnia, excessive daytime sleepiness, restless or shaky leg movements at night, intense dreams associated with REM behavior disorder, or poor sleep due to depression. While you will need professional medical assistance to determine what's causing your sleep problems, the following will help you understand what may be going on. If you have insomnia, then you likely have a hard time getting a good night’s sleep. Those with insomnia have trouble falling asleep, and may only sleep for a few hours at a time. Laboratory (polysomnographic and electroencephalographic (EEG)) studies of sleep have shown that people with Parkinson's, who are not depressed, show decreases in deep sleep, too much light sleep as well as increases in sleep fragmentation and multiple night wakings. Excessive daytime sleepiness is common in both early and mid-stage PD and may be related to insomnia. If you cannot get a good night’s sleep, you are going to feel sleepy during the daytime. 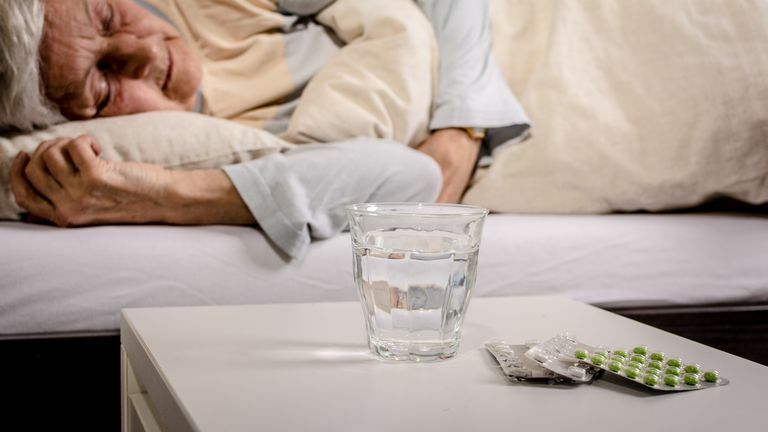 Parkinson's medications can also contribute to excessive sleepiness. It is also possible to experience sudden and irresistible daytime "sleep attacks," which are a rare side effect of dopamine agonists pramipexole and ropinirole as well as high doses of any dopaminergic drug. Do you often feel the irresistible urge to move your legs around during the night in order to get comfortable? If so, you might have periodic limb movement disorder (PLMD) or restless legs syndrome (RLS). PLMD causes slow rhythmic movements of the legs and feet, whereas restless legs syndrome causes more twitchy unpleasant sensations in the legs. Naturally, if you are frequently moving your legs, you are likely to wake up throughout the night, limiting your ability to get a good night’s sleep. Periodic limb movements are quite common in older adults as well as those with Parkinson's. Restless legs syndrome frequently affects middle-aged and older adults in addition to people with PD. REM sleep behavior disorder (RBD) can cause you to act out violent dreams, also can also make it difficult to get a good night's sleep. REM sleep, or rapid eye movement sleep, is the form of deep sleep where you have the most intense dreams. Usually, when you dream during REM sleep, nerve impulses going to your muscles are blocked so that you cannot act out your dreams. In REM behavior disorders, that blocking of the muscle impulses no longer occurs, so you are then free to act out your dreams. While estimates vary dramatically, approximately 50 percent of PD patients are estimated to have partial or complete loss of muscle atonia during REM sleep. If you have autonomic dysfunction, you are also more likely to develop sleep apnea. Fortunately, most breathing-related sleep disorders are not common among those with Parkinson's. Depression is seen in approximately 40% of PD patients in the course of their disease. Most persons with depression, including PD patients, also will experience problems with sleep. In depression, sleep does not refresh you like it used to, or you wake up too early in the morning. Dreams for depressed people are different, too -- they are rare and often depict a single image. In addition to the conditions already mentioned, during the later stages of PD, you also may experience sleep problems related to higher doses of medications, such as hallucinations. As many as 33% of Parkinson's patients during mid and later stages of the disorder experience hallucinations, related to medication side effects. Hallucinations tend to occur visually (seeing things that are not really there) rather than hearing them (hearing things that are not really there). They are frequently associated with vivid dreams. Kumar, S., Bhatia, M., & Behari, M. (2002). Sleep disorders in Parkinson's disease. Mov Disord, 17(4), 775-781. Larsen, J. P., & Tandberg, E. (2001). Sleep disorders in patients with Parkinson's disease: epidemiology and management. CNS Drugs, 15(4), 267-275. Olson, E. J., Boeve, B. F., & Silber, M. H. (2000). Rapid eye movement sleep behaviour disorder: demographic, clinical and laboratory findings in 93 cases. Brain, 123 ( Pt 2), 331-339. Pappert, E. J., Goetz, C. G., Niederman, F. G., Raman, R., & Leurgans, S. (1999). Hallucinations, sleep fragmentation, and altered dream phenomena in Parkinson's disease. Mov Disord, 14(1), 117-121. Cartwright, R. (2005). Dreaming as a mood regulation system. In: Principles and Practice of Sleep medicine. 4th edition, (M. Kryger, T. Roth and W. Dement Eds); pps 565-572. Stacy, M. (2002). Sleep disorders in Parkinson's disease: epidemiology and management. Drugs Aging, 19(10), 733-739.